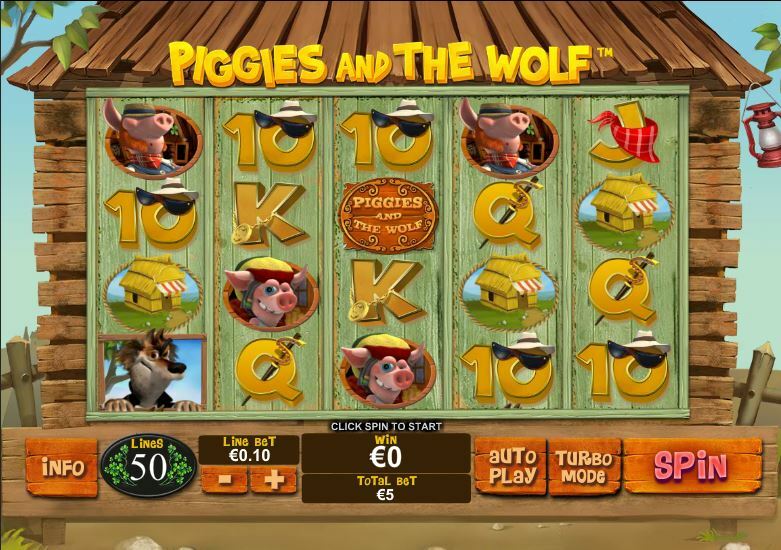 The story of the three little pigs and the wolf that huffed and puffed and took their houses down is a popular one, and there are a couple of slot machines already with this theme. You will see it in Piggies And The Wolf as well, a game with plenty of modern features and with a modern design. It’s a fun title, with characters that will make you smile and with a 3D design that you will enjoy. The game comes from Playtech, a well known and popular developer. The game has more paylines than your average Playtech slot, 50 of them being used in this case. You get stacked wilds along the way, scatter symbols, a bonus game and free spins. A $250,000 top prize is possible. Stacked wild symbols are going to make appearances during this game, and they will be responsible for the start of at least one bonus game. Another symbol is the scatter, with the free spins which start up thanks to them. Finally, we have a bonus game, also started with help from a scatter. The wild symbol can appear both in stacked and in regular mode. The regular wild is available on the 2nd and the 4th reels, while stacked wilds appear on the 1st, 3rd and 5th reels. It can only form its own combinations when five symbols are on the same line, otherwise it will always help you form a combo with regular symbols. If it does form a combo, it pays 2,500 times the line wager. This feature starts up whenever the stacked wild occupies the entire 5th reel. The Wolf wild will appear next, on a motorbike. He will huff n’ puff, blowing away symbols found on the game’s reels. This will make the symbols shuffle around, so that new combinations can be formed. The first scatter symbol gives away a prize worth 2x the bet and also triggers free spins. The image which this scatter uses has the Game Logo on it. 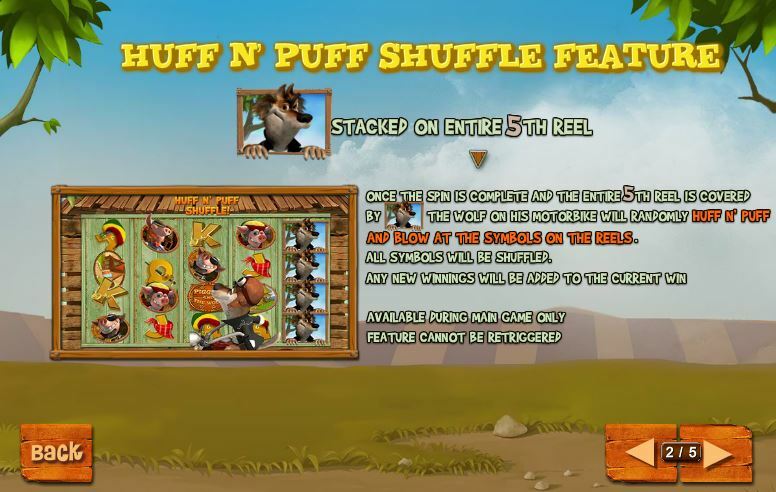 Scatters are used on the reels 1, 3 and 5, all three being required to have it before the free spins can start. You are awarded 15 spins for free when this happens. Whenever a Wolf shows up on the right side of one of the three pig symbols, the result is something called Pigs Running Wild. 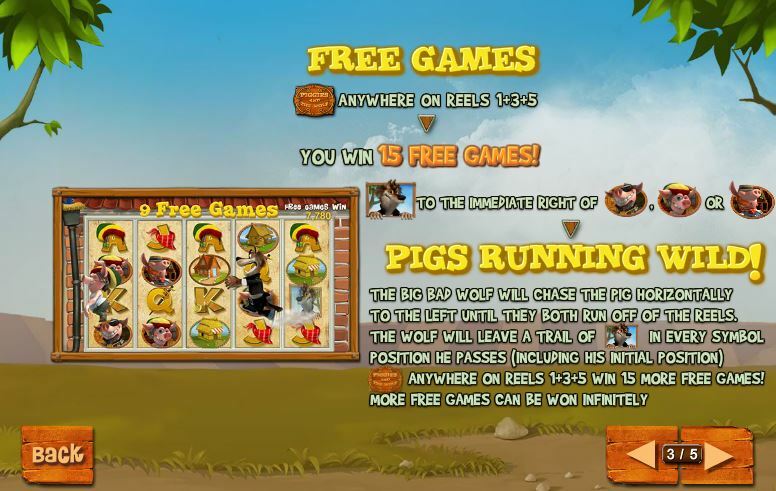 The wolf starts chasing the poor little pig, towards the left side of the game area, until they both go off the screen. As the wolf runs, he leaves a trail of wilds behind him. A second scatter symbol, with a miniature planet on it, will also appear, and it’s also reserved for three reels (1, 3 and 5). Having it appear at the same time on all three reels will get you access to the bonus game. In it, the Big Bad Wolf attempts to blow down houses. He starts with the straw house, goes on to the wood cabin and ends up at the brick house. You have to choose one of the three available symbols before each puff, to help out the wolf. Each successful puff will bring you a cash prize. 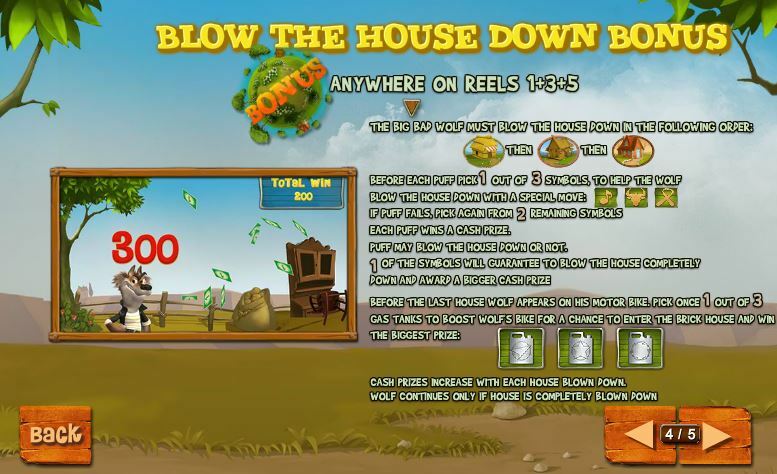 In order to get from one house to the next, you first have to blow down the first one completely. You might not have the option to change the number of active lines, they’re always at 50, but you can modify the line bet as you see fit. It can be just $0.01, or it can reach a top value of $100. The betting range of the slot is between $0.50 and $5,000. 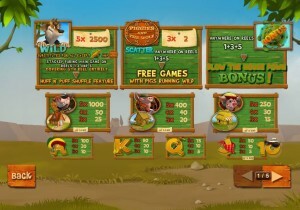 The Wolf wild rewards players with 2,500 coins when they form a five symbol combo, meaning up to $250,000 cash. I’ve enjoyed playing this game, and not just because I’m very familiar with the story from when I was a child. It’s well designed, with lots of animations on and off the reels, with the pig characters being funny and with the bonus games being themed around the story. Overall, it looks like a game you will have fun playing, even if you don’t know how the original story goes. Symbols: Wolf (wild, 2,500 coins), Game Logo (2x the bet, scatter), Mini Planet (scatter), Cool Pig (1,000 coins), Brick House (1,000 coins), Redhead Pig (400 coins), Wood House (400 coins), Redneck Pig (250 coins), Straw House (250 coins), Ace (100 coins), King (80 coins), Queen (75 coins), Jack (50 coins) and 10 (50 coins). 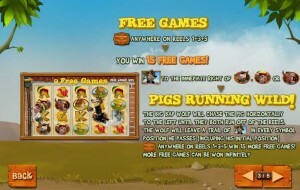 The story with the three pigs, which tries to teach children the value of a thing well done, will be something that plenty of players will want to experience in the form of a slot machine. It does well in plenty of areas, but it’s very expensive and the top payout only gives you a 2,500x multiplier. 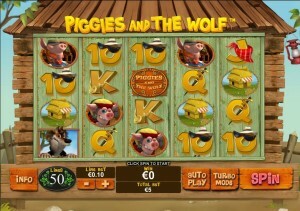 Piggies And The Wolf can be found at any Playtech casino, where you get a chance to play it for real money or in free mode.